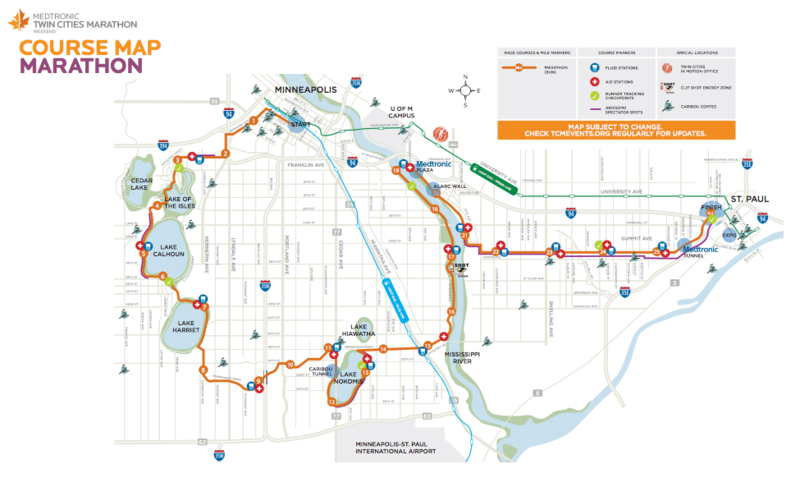 The Twin Cities Marathon, which describes itself as the most beautiful urban marathon in America, is one month away from filling the streets of Minneapolis and St. Paul with crowd barriers and thousands of runners. But what is this local tradition? 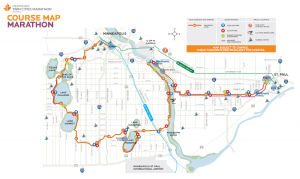 The Medtronic Twin Cities Marathon course map. Courtesy of Twin Cities in Motion. First off, the full name of this event is the Medtronic Twin Cities Marathon. Medtronic, a medical devices company with its operations headquarters in Minneapolis (for tax reasons, its legal headquarters is in Dublin, Ireland), is the lead sponsor. The marathon itself is organized by Twin Cities in Motion as its headline running event and fundraiser. Twin Cities in Motion is a local nonprofit organization tasked with promoting healthy lifestyles via running events and community outreach. TCIM runs 21 race events annually (about the maximum that the organization and area commuters could handle), mobilizing approximately 7,000 volunteers each year. Besides 26.2 miles of running, sweating, and aching (if you don’t train enough), the marathon course offers a scenic view of some of the best scenery and architecture that the Twin Cities have to offer, including a large portion of the Chain of Lakes, the banks of the Mississippi, and the architectural sights of two downtown areas. It’s also one of the top 10 marathons in the United States by size/popularity. It’s also styled “The Most Beautiful Urban Marathon in America” – not to boast, or anything. 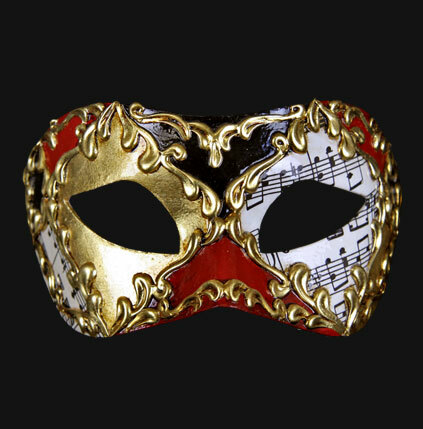 Online registration ends Monday, September 14, just before midnight.